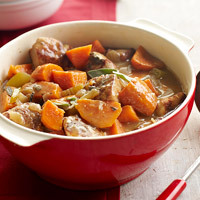 Even the sweet potato haters at my house loved this stew. I had everything on hand but the cranberry-apple juice. I’m really glad I chose not purchase it instead of substituting something else. This turned out great (even though my photo isn’t as pretty as the BHG photo). Looking forward to making this again. And taking a better photo. Sprinkle pork lightly with 1/2 teaspoon salt and 1/4 teaspoon pepper. Place flour in a large bowl; add pork and toss to coat. In a 5- to 6-quart Dutch oven heat 1 tablespoon of the oil over medium-high heat. Add half the pork; brown on all sides. Remove. Repeat with 1 tablespoon oil and remaining pork. Remove pork from pan. Add remaining tablespoon oil to pan along with onion and celery; cook 5 to 7 minutes or until tender. Stir in garlic. Sprinkle with any remaining flour; stir to coat. Slowly stir in broth, juice, and 1 cup water. 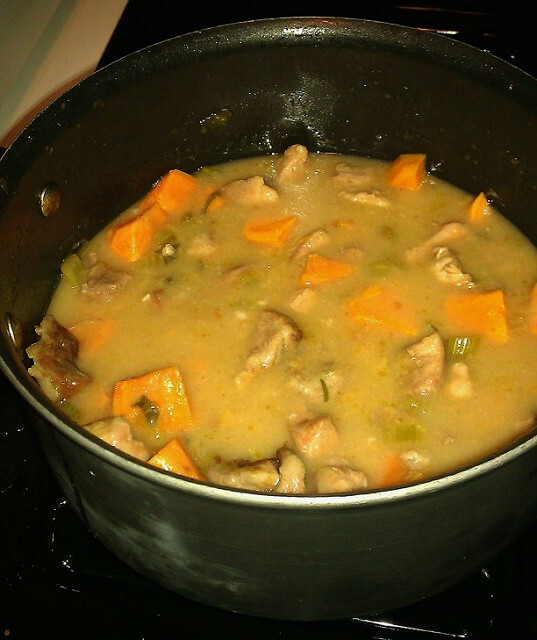 Return pork to pan; add sweet potatoes and sage. Bring to a simmer. Reduce heat and cook 20 to 25 minutes more until potatoes and pork are tender. Season to taste with salt and pepper. Top with nutmeg and fresh sage leaves. I love both of these things and it sounds yummy. Sounds yummy. I have the sweet potato and probably some pork in the freezer. Wind chill is 15. Think I’ll make this tomorrow.Cranberry/pomagranet juice ought to work.